In July 2016, when Canadians were beginning to think about Canada 150, I posted a brief article on ActiveHistory.ca about an emerging and largely crowdsourced project – The Confederation Debates – an initiative to digitize and popularize over 9,000 pages of Canada’s founding historical records. 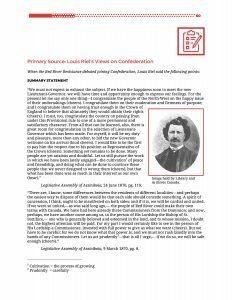 366 quotes of the day by pro- and anti-Confederation leaders, such as the one above, that we posted in both official languages between 1 July 2016 to 1 July 2017. Roughly half of these quotes were identified by volunteers. They were a big hit on social media and in classrooms. These quotes can be browsed here and will be posted to the legacy website soon. 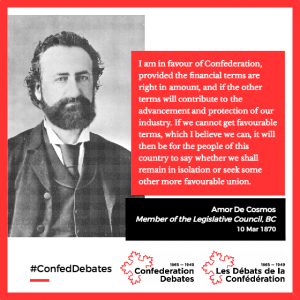 A mock parliamentary debate where students learn about why some politicians wanted to join Confederation while others believed that their province would suffer under the deal. Indigenous-history activities including a mock museum curation activity that encourages students to learn about their province’s treaty history via the diverse perspectives that informed their development. A downloadable XML dataset, that present and future Canadians can use for textual analysis. An e-booklet as well as an edited e-book with chapters composed by some of Canada’s leading scholars describing each province, territory, or region’s journey into Confederation. All of this already is — or will soon be — available for free on our website. All of the records are now transcribed, and almost half of these have already been converted into XML and posted to the legacy website. More of these transcribed records are being processed every day and all will be posted to the web within the next few months. The project could not have been completed without the volunteers who eagerly contributed to this 150th anniversary initiative. Some participants were new immigrants, eager to learn about their adopted country. Many were Ontario high school students who used the project to complete their mandatory volunteer hours. University students from across the country eagerly used the project to demonstrate their analytical skills and many leveraged this experience to gain paying positions at their home institutions. Retirees seeking a new hobby, or a way to participate in Canada 150 despite mobility challenges, comprised an unexpectedly large portion of our volunteers. At an early stage in the project, our transcription platform developers added weekly and all-time achievement charts. The live updating of these limited “gamification” features allowed volunteers to compare their contributions to their peers’. Several volunteers subsequently told us that they enjoyed this aspect of the project, and actively competed with other members for top rankings. Although many of our volunteers trained using our how-to YouTube video and had little directly correspondence with me, a key part of my job was using weekly emails and social media to foster a team culture and help them to understand how their efforts contributed to the project’s goals and deliverables. Most volunteers initially focused on reviewing records from their own province or region. Many, however, soon switched to records concerning other provinces, and enjoyed learning about other parts of the country. Since no historical expertise was necessary to perform the work, it was wonderful to see so many Canadians eager to learn about historical perspectives from other parts of the country. In a Web 2.0 world, volunteers were eager to provide feedback about the content they read. Using Google Forms, users recommended thousands of quotes of the day to our social media and education teams. The same volunteers used another form to report thousands of typos or other inconsistencies that appeared in the original documents. I remain convinced that giving volunteers the opportunity to making meaningful analytical contributions encouraged many to give each page very focused attention. I remain thrilled and thankful that so many Canadians took it upon themselves to participate in this Canada 150 initiative. Thanks to their efforts, we were able to repackage thousands of pages of records into forms that Canadians of nearly all ages and walks of life can appreciate. It was a privilege to lead this undertaking, and I hope that other digital projects will continue to use crowdsourcing to engage with this widespread hunger for diverse historical perspectives in the years to come.